Today on KPFA Radio’s Women’s Magazine we will look at a current issue in the conflict that’s been brewing between the feminist and trans community for many years We will hear a talk by UC Berkeley Professor Wendy Brown on the war between some larger reproductive rights groups and with trans activists that demand that reproductive groups drop the word “woman” and replace it with “reproductive autonomy for all people” because using the word “woman” can exclude trans men from inclusion in reproductive language. 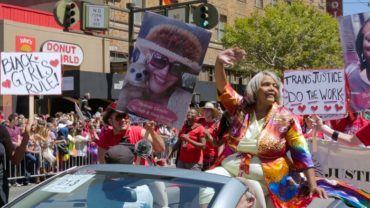 And Kate Raphael speaks with well know trans activist Miss Major Griffin Gracy and StormMiguel Florez about the new film, MAJOR. This film which is premiering tonight in Piedmont, documents Miss Major’s life and work to dismantle the prison industrial complex and support trans women in and out of prison.